Both upper and lower compartments lock. Store up to 7 guns, plus ammunition and other hunting equipment. 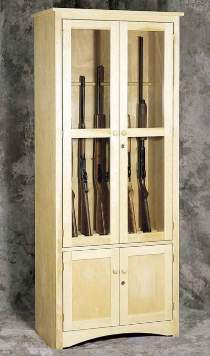 Gun Cabinet Hardware includes hinges, locks, catches, retainer buttons, wood knobs and mounting screws. Glass and optional drawer slide not included.